Which type of climate voter are you? Hopefully not the 1 in 10 who prefers a climate denier. A new analysis has found that 10% of the population of voters are more likely to vote for a candidate who opposes action on global warming. 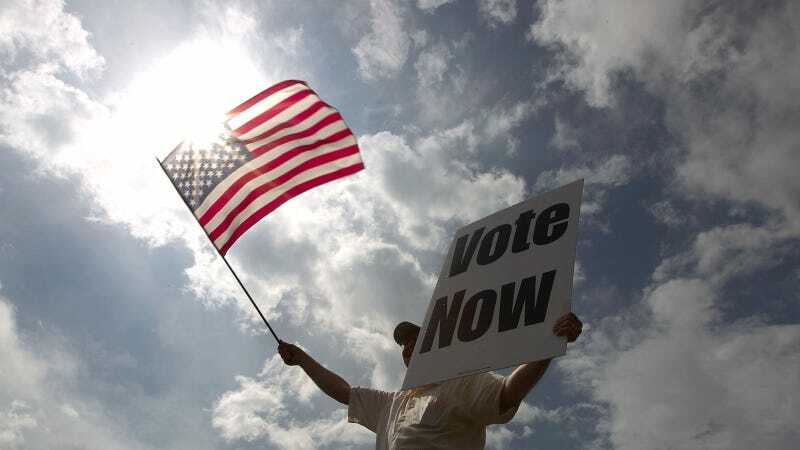 Conducted by Yale University and George Mason University, the survey found that Americans can be divided into six distinct groups when it comes to climate and environmental voting preferences. Only members of the most anti-climate action group, the Dismissive (10% of the population; 10% of registered voters), are likely to vote for a presidential candidate who actually prioritizes their opposition to taking action to curtail human-caused climate change. Conversely, presidential candidates who support taking climate action will not only garner the support of the most concerned segment, the Alarmed (17% of the U.S. population; 19% of registered voters), but they will also likely get a large majority of the Concerned (28% of the population; 29% of registered voters)—a combined total approaching 50% of registered voters. Then there's the "independent voters" of climate change: Those who haven't much considered the issue and don't see it being very relevant to them. About a third of those surveyed back in late March fell into these two middle segments, the Cautious and the Disengaged. The remaining fifth were equally divided between the Doubtful and Dismissive. While less than a fifth of the population being Alarmed may not seem like data that favors climate activists, it's actually 5 percentage points higher than last year and comparable to late 2008 when global warming concern was at a high point nationally. This finding aligns with other recent polling that has found concern for climate change to be growing among the American electorate. A March Gallup poll found that more Americans—64% of adults—were concerned about global warming than at any time in nearly a decade. Still, there is an extremely wide range of views and degrees of prioritization. "As Americans decide which candidate to support in the upcoming presidential election, global warming, environmental protection and clean energy production are central to the decisions of some segments and largely irrelevant to others," state the authors of the recent analysis. With such a stark contract in climate change views held by the two presidential candidates, Hillary Clinton and Donald Trump, it's not surprising that the categorical breakdown of candidate preference was also pretty extreme. According to the survey, 64% of the Alarmed planned to vote for Clinton and 61% of the Dismissive planned to vote for Trump. With both camps recently doubling down on their approach to climate issues, the decision regarding who to vote for if you care about environmental issues continues to get easier. It's just a matter of determining how much you care.